On May 1, 2007, an estimated 35,000 protesters gathered for a peaceful demonstration in Los Angeles’ MacArthur Park. Advocacy groups around the country designated the date “A Day Without an Immigrant.” Through a general strike, advocates called for immigration reform and protested legislation designed to beef up border security and the U.S. immigration detention system. The legislation failed in the Senate, but the May Day tradition stuck, and for the past decade, A Day Without an Immigrant has been marked by a weekday protest in Los Angeles. Many of LA’s workers are immigrants, and they are increasingly organized, so this year’s walkout became yet another public condemnation of President Donald Trump and his immigration policies. Around City Hall, street peddlers sold T-shirts featuring the president’s angry, pouty mug. Seeing the high numbers of “resistance” protesters of earlier marches, organizers had hoped the May Day protests would draw more than a hundred thousand people. However, only around 15,000 people showed up, the product perhaps of “resistance fatigue.” Still, the protests were a demonstration of a movement that has been building slowly over the years and is likely to remain a major force in California — a contingent of laborers born of an earlier farmers’ movement, but growing into a broader coalition as immigrant workers find their way into other fields. “We know what it’s like to work hard — we are construction workers, janitors, caretakers, cooks,” María Elena Durazo, a former top leader at the the Hotel Employees and Restaurant Employees Union and the LA AFL-CIO, the county’s civil liberties union, told a crowd in front of LA City Hall after the rally. The daughter of Mexican farm workers, Durazo has played a major role in growing the union’s Latino base while advocating for immigrant rights. “Trump has referred to many of us as bad hombres,” she said. “Well, now he’ll get to know some angry women, too. Because we’ll be his worst nightmare.” She translated her own words into Spanish, to excited applause. 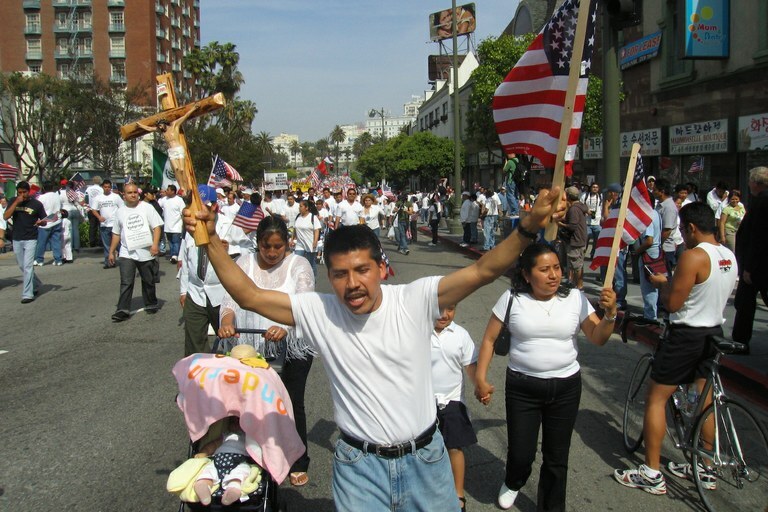 The first march marking A Day Without Immigrants took place on May, 1, 2006, in more than 50 cities across the country. In Los Angeles, over 300,000 participated. One of the nation’s largest labor federations, the LA AFL-CIO represents more than 800,000 workers in most of the industries that power this city – from entertainment to construction, health care and education. But Los Angeles isn’t what it was in 1885, when cigar-makers, tailors and bakers first began to organize. Today, immigrants comprise an estimated 35 percent of the local population. They enjoy greater upward economic mobility than they did two or three decades ago and can be found in a wide array of professional fields, as well as retail, manufacturing and construction. Still, working-class or undocumented immigrants are the ones doing the most difficult jobs. Lower-paid employees, such as fast-food workers, taxi drivers, hotel janitors and retail clerks have grown in numbers. And in a city like LA, they’re also growing in organizing power. Durazo’s potential bid for Congress reflects a desire to fuse together labor, community organizing and political power in California, an arena that’s increasingly dominated by progressive Latinos. Unions today represent only 11 percent of workers in the U.S. In an effort to reinvent themselves, unions have had to reach out to so-called “alt-labor” — service workers in restaurants, domestic work, farms and retail, among others — through foundation-funded worker centers and community organizations. These days, LA is an epicenter for smaller co-ops organized by trade, geographic area or cultural or racial identity. Typically governed by the workers themselves — and with money from foundations or big national unions like AFL-CIO — co-ops are defined by collective decision-making their and the needs of the particular industry they represent. From the Black Workers Center to the Clean Carwash Campaign, worker centers are redefining labor rights around the city. Alt-workers are here to stay: According to the Bureau of Labor Statistics, more than 100 million people in America work in service industries, and one out of 10 workers is self-employed. In this pro-big business Trump era, California may be the litmus test for how to mobilize a new generation of entrepreneurial and immigrant workers into a lasting and progressive political force. At the Day Without an Immigrant rally, workers from unions big and small skipped their shifts and held banners on behalf of their groups, marching three miles under the hot sun. Rafael Gómez stood behind his cart selling fresh fruit to passersby nonstop. This wasn’t his typical place of business, he said, but he knew there was much more to be made here on this day, only a block away from LA City Hall along the protesters’ route.